Classes started last week, but I really don’t get my mind focused on teaching until after the long MLK weekend, which marks the commencement of the spring semester just as Labor Day cues the fall. The administrative work of my other role as department chair is continuous, which makes teaching even more special: a regular break from the tedious. I get three course releases for being chair, which means I am reduced to teaching just one course (Tudor-Stuart England) per semester, but this particular semester I’m also teaching a graduate course (Topics in European History: the European Witch Trials): this particular combination of content and community will make for an interesting semester, I am sure. The Tudor-Stuart class is always filled with the best and the brightest students, not only among our History majors but also English and Theater majors. The Tudors have been so consistently topical in popular culture over the last decade or so that my students will feel that they “know” them; the Stuarts are more elusive. 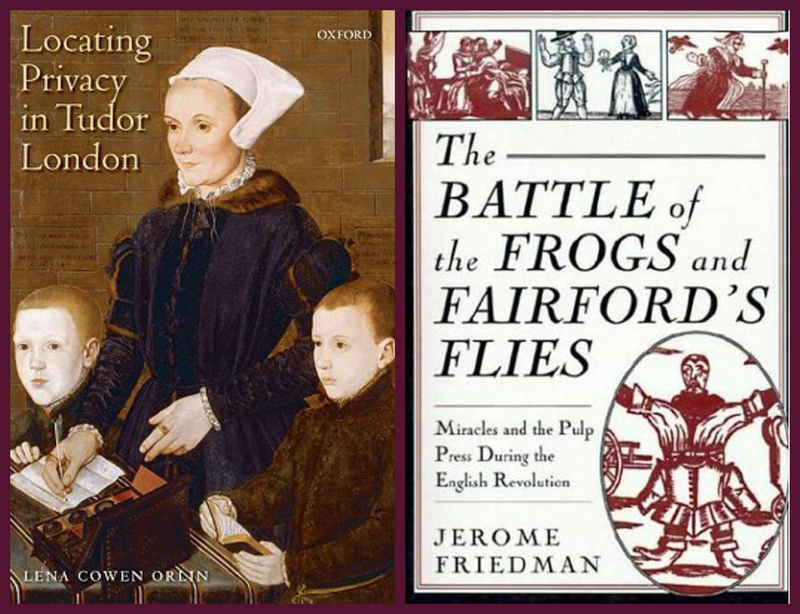 We’ll cover all the big events, most prominently the English Reformation in the sixteenth century and the English Revolution in the seventeenth, but two of the course texts will (hopefully) enable my students to get a bit more into the homes and heads of Tudor and Stuart people. I’ve never used Orlin’s text in class before (but what could be more essential than privacy? 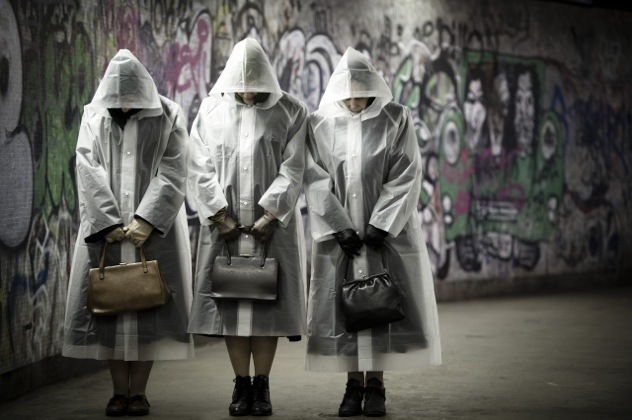 ), but Friedman’s subject matter–cheap print–opens up a much wider window into the Revolution. 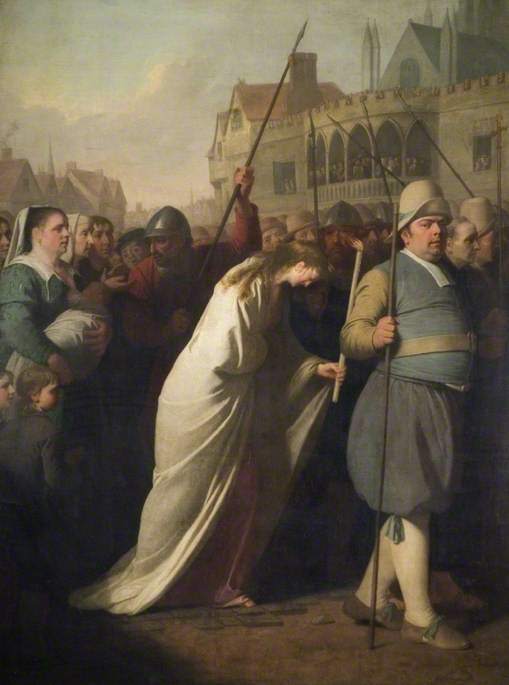 I teach two courses on the European witch trials of the sixteenth and seventeenth centuries, one undergraduate and one graduate, and I much prefer the latter. 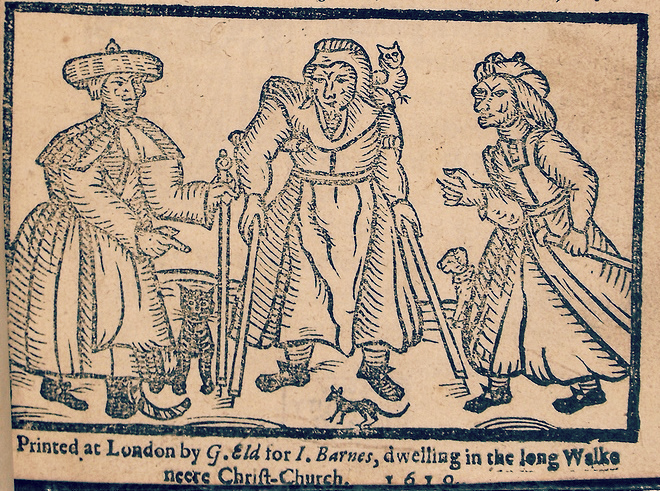 The reasons why more than 100,ooo people were tried for witchcraft in this (early modern) era are complex, and I find that undergraduates want them to be simple. They don’t have the background, the patience, or the time (or inclination, really) to read all the texts they need to read in order to figure out all the factors that went into this frenzy. But graduate students read: we go through at least one book (or series of scholarly articles) a week in my class. 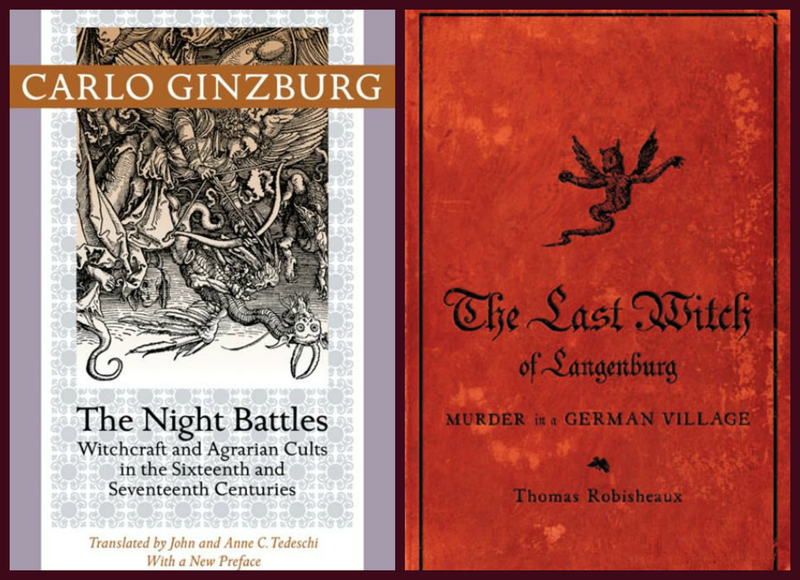 It’s a dynamic field, so there are always great titles to choose from: I always start with a few texts on the fifteenth century to lay the foundation, and then take a regional tour around those areas that experienced intensive witch-hunting. There are definitely some universal causes of the witch hunts in this era, but the catalysts are more local, even personal, so this is a topic that can be well-served by case studies such as Carlo Ginzburg’s Night Battles, a classic study of counter-magic in northern Italy, Thomas Robisheaux’s Last Witch of Langenburg, and James Sharpe’s Bewitching of Anne Gunter. We will try to understand sensationalistic cases of demonic possession in France (through Sarah Ferber’s Demonic Possession and Exorcism in Early Modern France), some of the anthropological and psychological factors present in the region which experienced the most intense witch-hunting in Europe (through Lyndal Roper’s Witch Craze. Terror and Fantasy in Baroque Germany), and one of the last major European series of trials (30 years before Salem, through P.G. 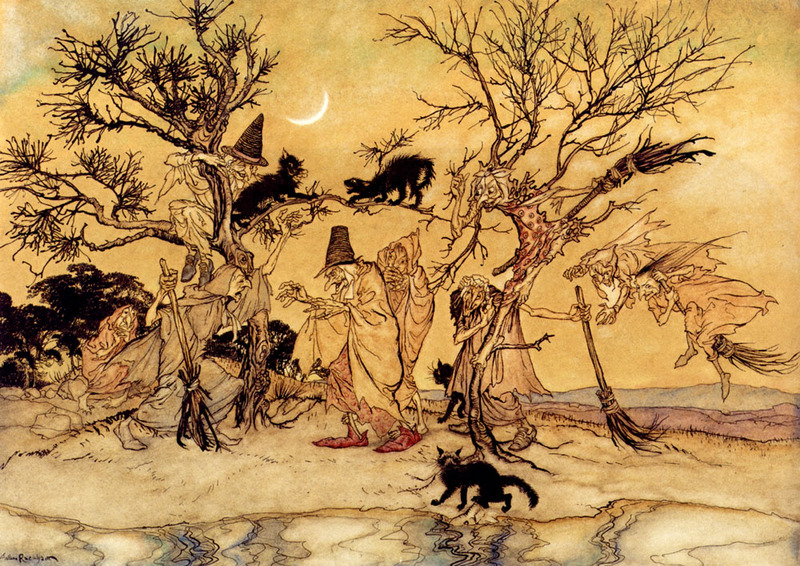 Maxwell-Stuart’s Abundance of Witches. 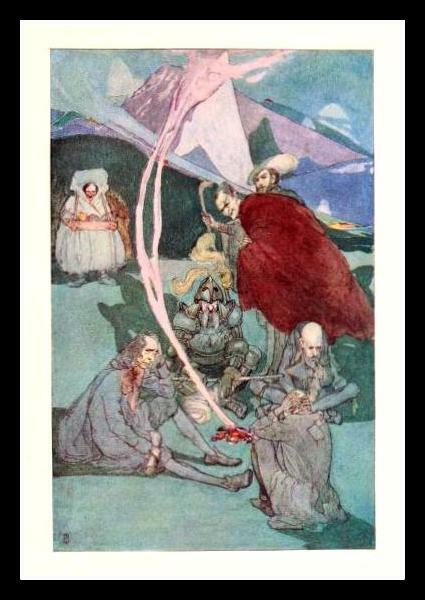 The Great Scottish Witch-Hunt). 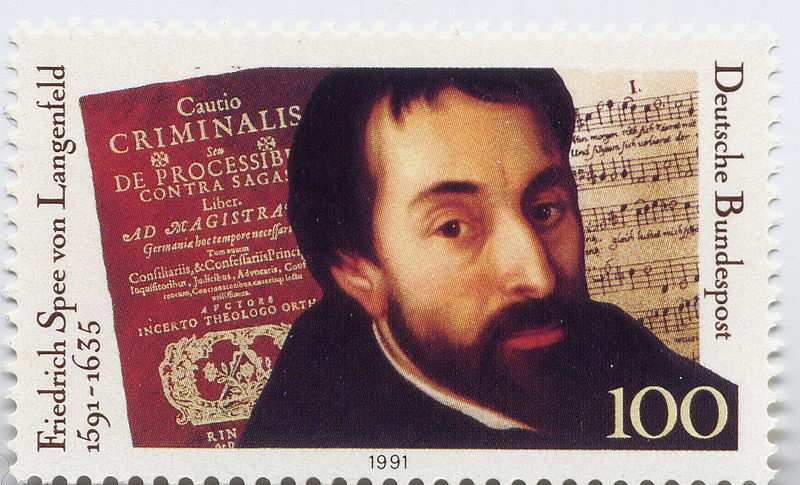 I always try to switch out the books every time I teach a class to keep everything “fresh”, but two perennial texts for this course are Friedrich Spee’s Cautio Criminalis (1631), a plea for judicial caution and against torture by a Jesuit confessor and poet who had witnessed (and participated) in the worst trials in Germany and Charles Zika’s The Appearance of Witchcraft. 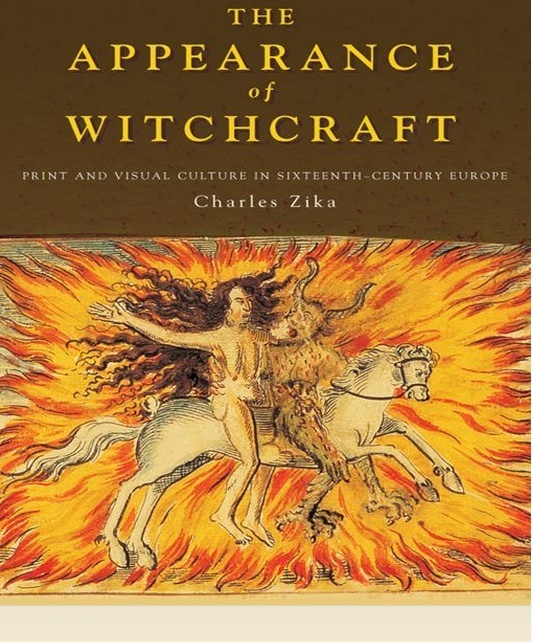 The image of the witch, projected far and wide through the relatively new medium of print, is one of those universal factors I was referring to above, and Zika’s visual analysis is masterful. 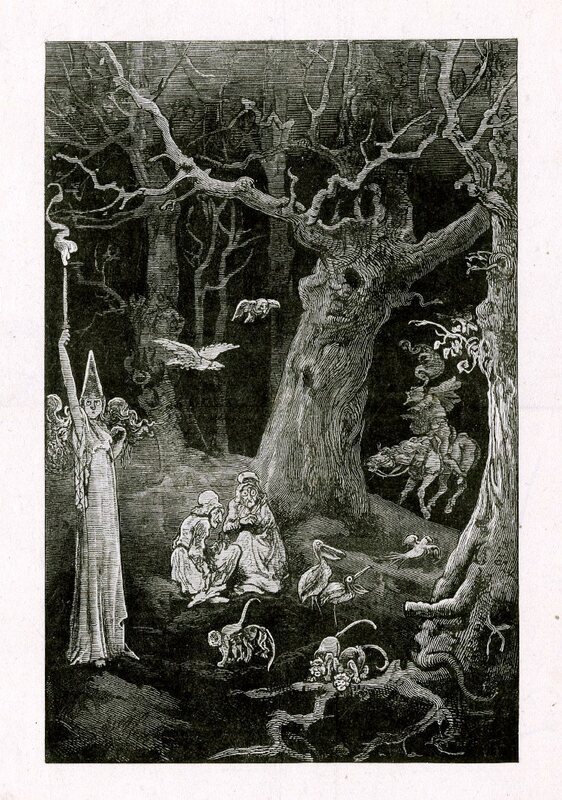 It strikes me that there are many historical, folkloric, and cultural connections between witches and trees: witches are often described and depicted as gathering under, hanging from, and riding on branches of trees, “witches’ broom” is a tree disease or deformity, the rowan tree was traditionally associated with the warding off of witches. I’m leaving aside the arboreal associations of modern witchcraft. There’s something about the forest primeval in general, and trees in particular, that creates an environment of secrecy and sorcery: this was a setting that was cultivated by Renaissance etchers and resurrected by Victorian illustrators. The trees are often spindly, haggard, misshapen, and barren, like the women underneath them. 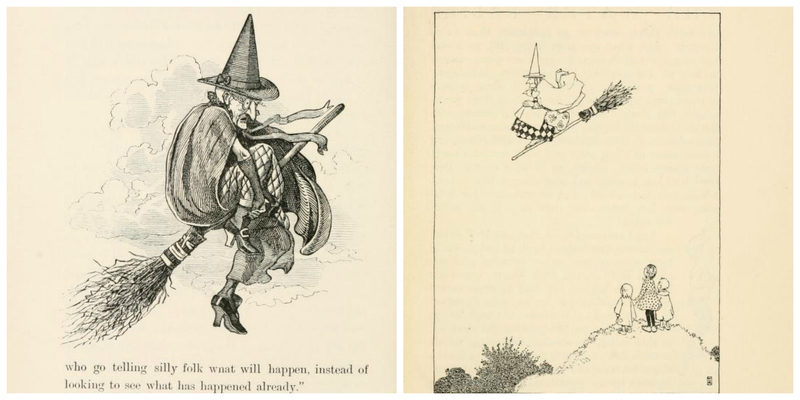 Daniel Hopfer, Gib Frid (Let me Go), early 16th century etching, British Museum; Edward Gurden Dalziel, illustration from Judy Magazine, 13 February 1878, British Museum; Arthur Rackham, ‘The Witches Sabbath’ illustration for ‘The Legend of Sleepy Hollow’, George Harrap & Co, 1928. The association seems to be strongest in the folklore associated with Italian witchcraft. In Benevento, the “City of Witches” (occasionally referenced as the “Italian Salem”), witches from all over the world were said to gather annually under a storied walnut tree–a tree that was definitely fruitful. 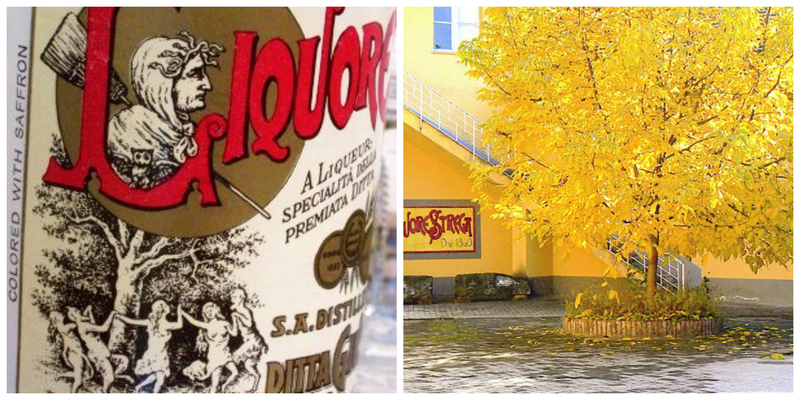 It’s an age-old, deeply-rooted story whose origins seem impossible to trace (at least for a short blog post), but the streghe under the walnut tree have certainly inspired a variety of cultural expressions and commodities, from works of art to musical compositions to the famous Strega digestif, manufactured right in Benevento since 1860. Guglielmo della Porta, The Witches at the Walnut Tree of Benevento, pen and ink drawing, mid 16th century, Metropolitan Museum of Art, New York; Lithographed songsheet for Paganini’s Dance of the Witches, 1830s, British Museum; Strega label and walnut tree outside the Alberti factory in Benevento. 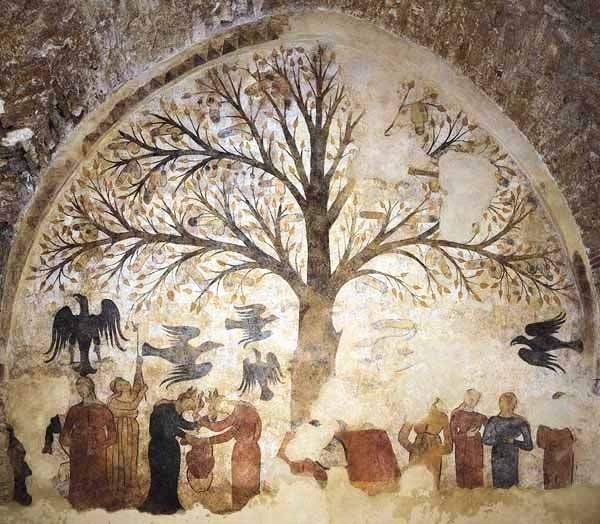 To the north there is another representation of witches gathered under a fertile tree: the famous mural of Massa Maritimma, dating from the mid- to late 13th century and uncovered in 2000. 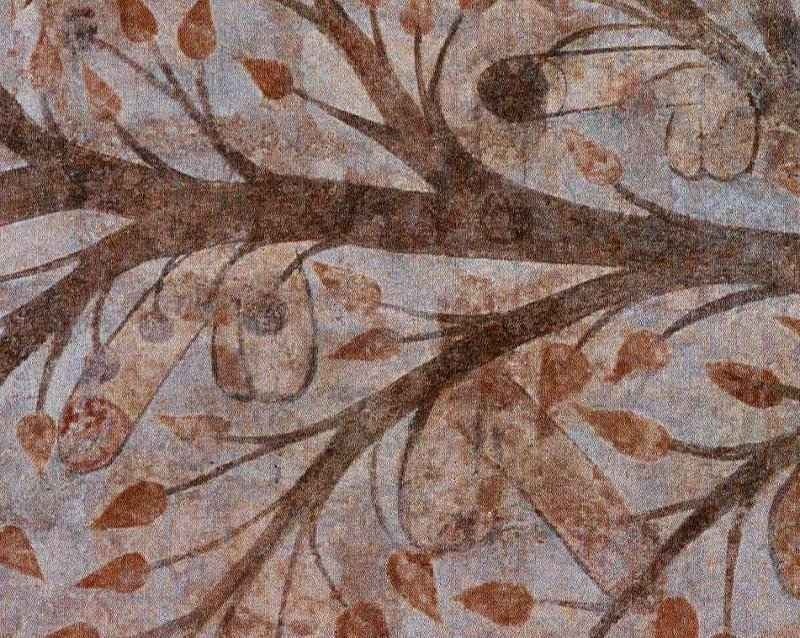 Situated on a wall in the town center enclosing the communal “Fountain of Abundance”, this tree bears strange fruit: phalluses which the women below are picking and gathering. The discovery of the obscene (???) mural was shocking for some (and its subsequent cleaning remains controversial—you can read about it here), but not to anyone who has any familiarity with the Malleus Maleficarum (the “Witches’ Hammer) a practical guide to identifying, detecting and prosecuting witches published in 1487. Due to its sheer popularity, which is evidenced by many editions and translations, most historians believe that the Malleus contributed to the intensification of witch-hunting in the early modern era, though its exact role is open to debate. It seems pretty clear to me that the book’s popularity is based in its accessibility, and the sensationalistic anecdotes that its authors (Heinrich Kramer and Jacob Sprenger–probably more the former than the latter) include, among them oft-cited passages about witches stealing men’s “virile members” and hiding them in nests nestled in the branches of trees. The Massa Marittima Mural and detail; you can see it in situ here, and read more about its symbolism here. 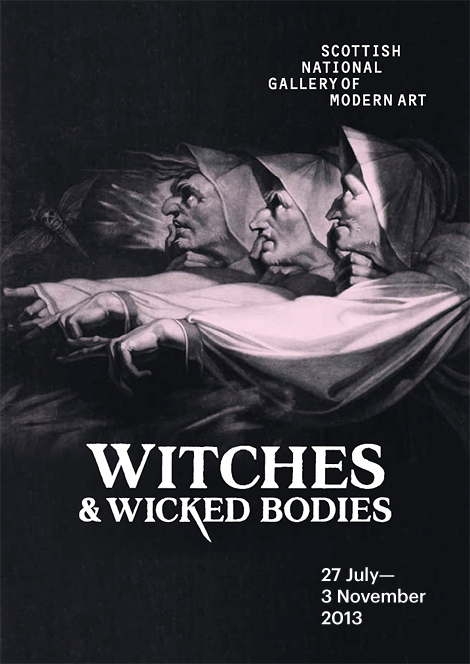 Because I’m not going to make it to Scotland this summer (or Fall, probably) I have been perusing the various sites and reviews devoted to the Scottish National Gallery of Modern Art’s current exhibition, Witches and Wicked Bodies, to see if I can find witchcraft images that I haven’t seen before. The depiction of witchcraft from the Renaissance on is a compelling visual and cultural topic: I can’t believe there hasn’t been an exhibition before this. I have a whole portfolio of images that I use in my various courses, and rely heavily on the analysis in Charles Zika’s great book: The Appearance of Witchcraft: Print and Visual Culture in Sixteenth-century Europe (for the best analysis of the really provocative prints of early sixteenth-century artist Hans Baldung Grien) as well as the sources and images available at another ongoing Scottish(digital) exhibition: The Damned Art: Witchcraft and Demonology. 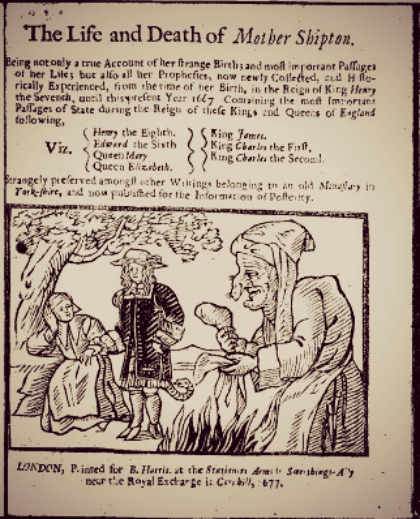 Witchcraft has been serious business in Scotland, from the days of King James VI’s Daemonologie (1597) to the present. 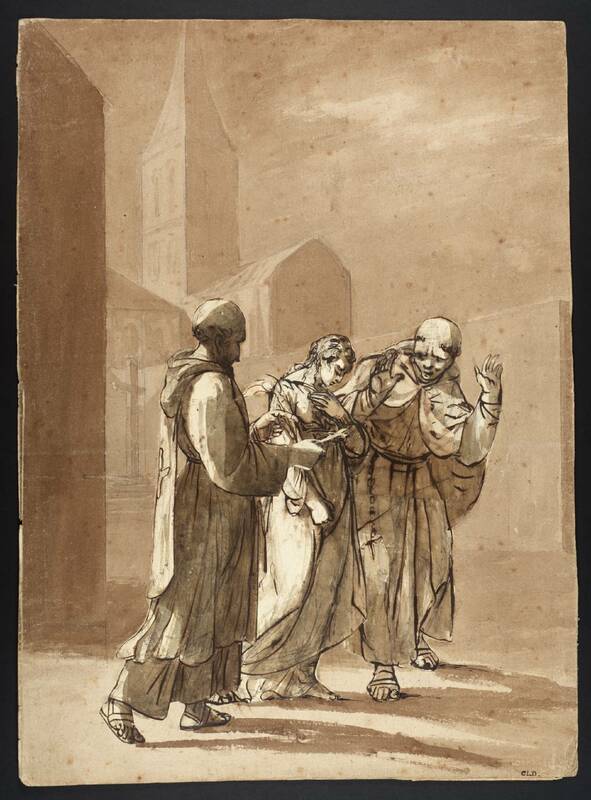 Looking through the images from these various sources, I am struck by the rule of three: how very often witches are depicted in a group of three, as in Henry Fuseli’s 1785 iconic image of the Three Weird Sisters from Macbeth on the exhibition poster above. 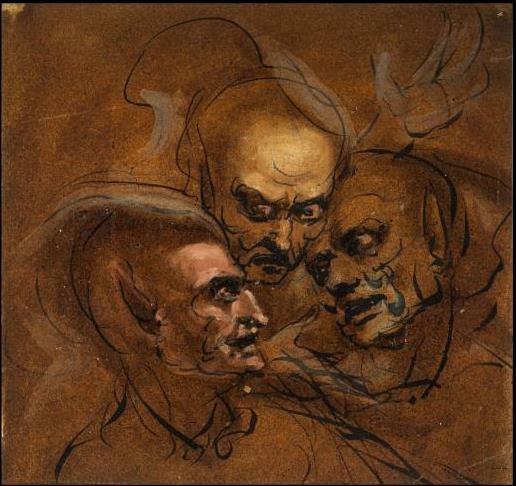 Fuseli’s image is easily explainable: it is based on Shakespeare’s three prophetic sisters which is in turn based on those of Holinshed’s Chronicle, which is in turn based on the traditional threefold warnings of doom. 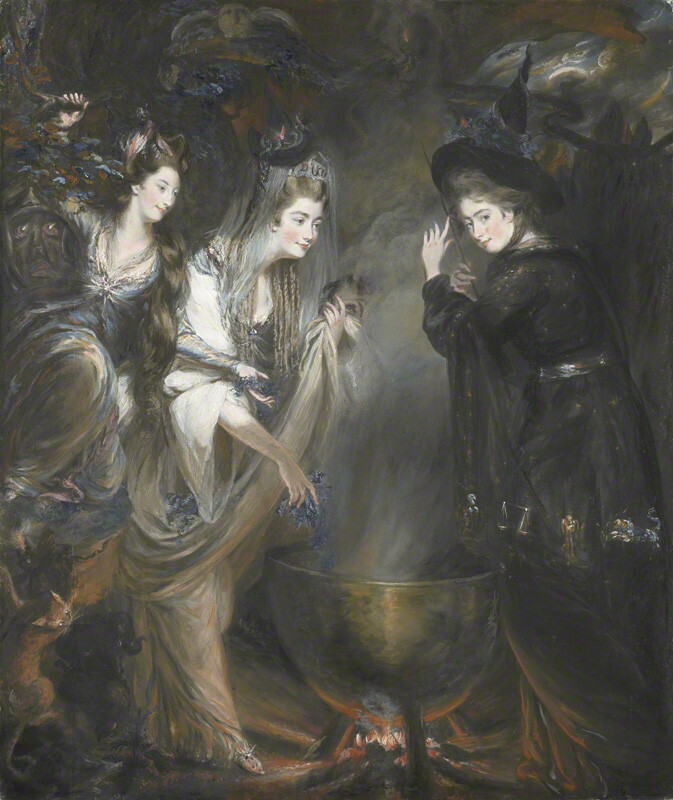 But even before Shakespeare’s time, witches are often found in parties of three, perhaps to depict a closed and empowered circle, the smallest coven or conspiracy, or a demonic inversion of the Holy Trinity. The Scotland show features several witchcraft themes, Macbeth and magic circles (as well as witches in flight and devilish rituals) which highlight the power of three. But then what about good things come in threes or third time’s a charm? Three Witches depicted in: Ulrich Molitor’s lamiis et phitonicis mulieribus (1489) and The Wonderful Discoverie of the Witchcrafts of Margaret and Phillip Flower (1619), Ferguson Collection, University of Glasgow; John Runciman, Three Satyrs’ Heads, 18th century, National Galleries of Scotland; Daniel Gardner, The Three Witches from Macbeth (Elizabeth Lamb, Viscountess Melbourne; Georgiana, Duchess of Devonshire; Anne Seymour Damer, 1775) National Portrait Gallery, London; William Blake, The Triple Hectate, 1795, National Galleries of Scotland; Arthur Rackham’s Three Witches/Gossips, 1911, from The Ingoldsby Legends of Myth & Marvels; the Weird Sisters in last year’s production of Macbeth at the Lyric Threatre in Belfast, Northern Ireland. No Goya—too scary! 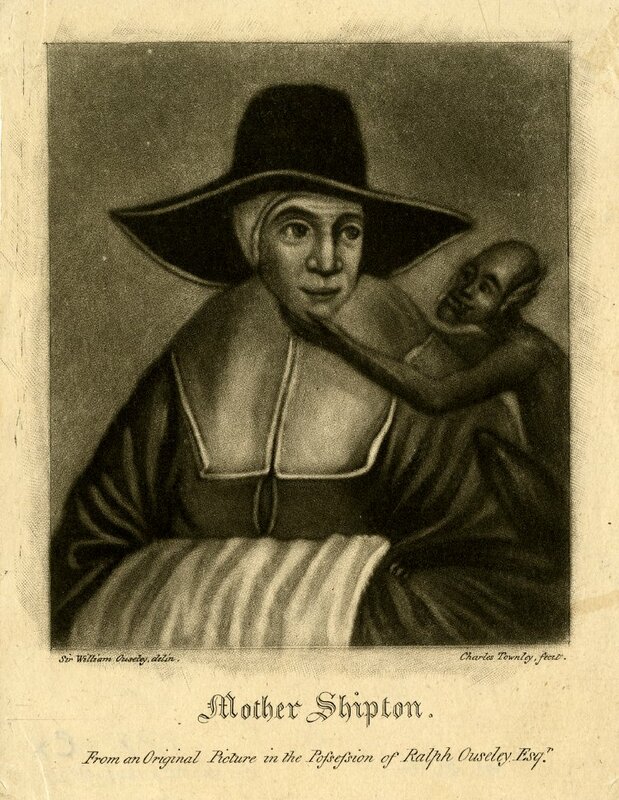 Rather contrarily, my offering for Mother’s Day weekend is not a warm, loving, and lovely caregiver but a prophesying crone: Mother Shipton, who most likely never existed. 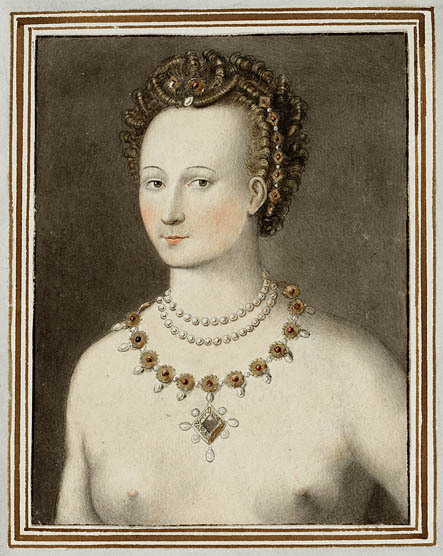 Supposedly born in the first years of the new Tudor dynasty in a Yorkshire cave (the product of a union between a poor wretch named Agatha and the Devil), Ursula Southeil or “Mother Shipton” rose to fame in the mid-seventeenth century, long after her supposed death. 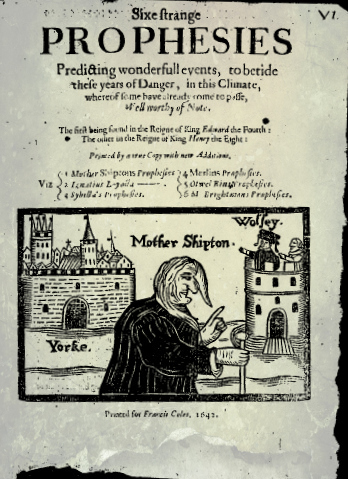 Just before the English Civil War, a time of high anxiety indeed, a series of Mother Shipton pamphlets suddenly appeared, containing predictions of things that, for the most part, had already happened, along with dire warnings of war and destruction. 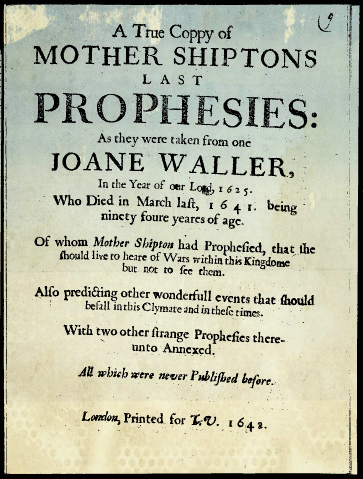 The first prophecy on the second 1642 pamphlet is typical Mother Shipton: Joane Waller should live to heare of Wars within this Kingdome but not to see them. The Civil War broke out in the same year of as the tract was published, but of course Waller had died the year before. 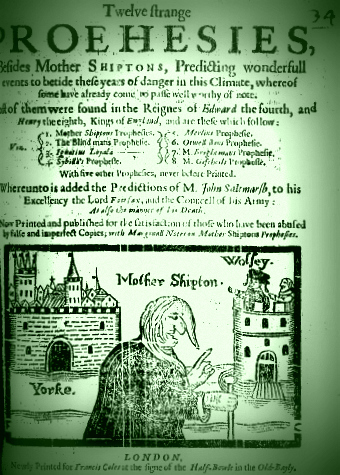 A similar assertion regarding Henry VIII’s chief minister, Cardinal Wolsey, that he would see York but never get there, was one of Mother Shipton’s most famous “predictions”. 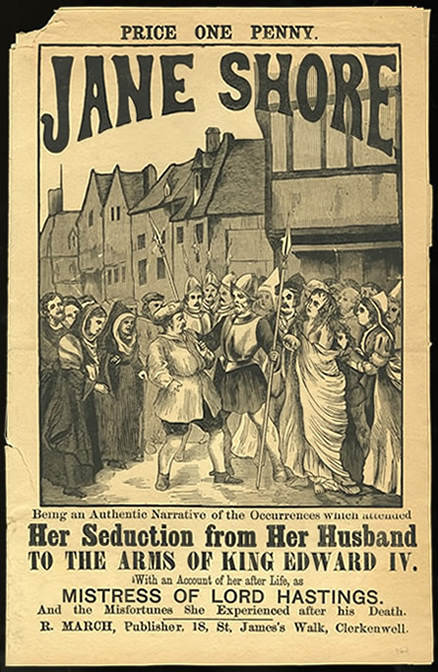 Her published prophecies continued through the Civil War (closely tied to current events) and after, and she joined the ranks of such legendary magicians as Merlin. 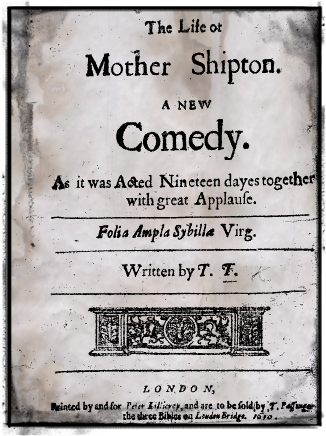 In the later seventeenth century, Mother Shipton’s biography and predictions were embellished rather vastly by a series of publications entitled The Life and Death of Mother Shipton, and her story was adapted for entertainment purposes, thus cementing her now-legendary character. 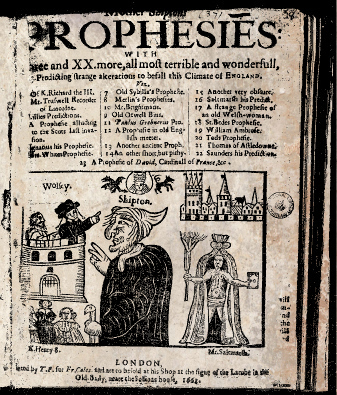 The transition from ominous witch-soothsayer to stock character is emblematic of the emergence of a collective rationalist mentality in the seventeenth century, with a corresponding decline in belief in magic and “wonder”, now assuming its more modern meaning. And that would probably be the end of Mother Shipton, consigned to a relatively minor character in the long history of sibyls and soothsayers, if she was not resurrected in the Victorian era. It’s always the Victorians! Charles Dickens first referenced her in a 1856 story, and then the entrepreneurial bookseller Charles Hindley published a new set of rhymed and timely prophecies that were supposedly based on a newly-discovered manuscript in the British Museum (he later confessed to making them up). Now Mother Shipton was predicting railroads, ships made of iron, wireless communication and all sorts of industrial innovations, as well as the ominous warning that the world then to an end shall come/ In Eighteen Hundred and Eighty-One, which was changed to 1991 in early-twentieth-century reprints. By that time, she had evolved yet again, into a fairy-tale character and (later) a tourist attraction. Charles Townley print of Mother Shipton and her familiar, 1800, British Museum, Linley Sanbourne and W. Heath Robinson illustrations of Mother Shipton on her broomstick for Charles Kingsley’s The Water-Babies. 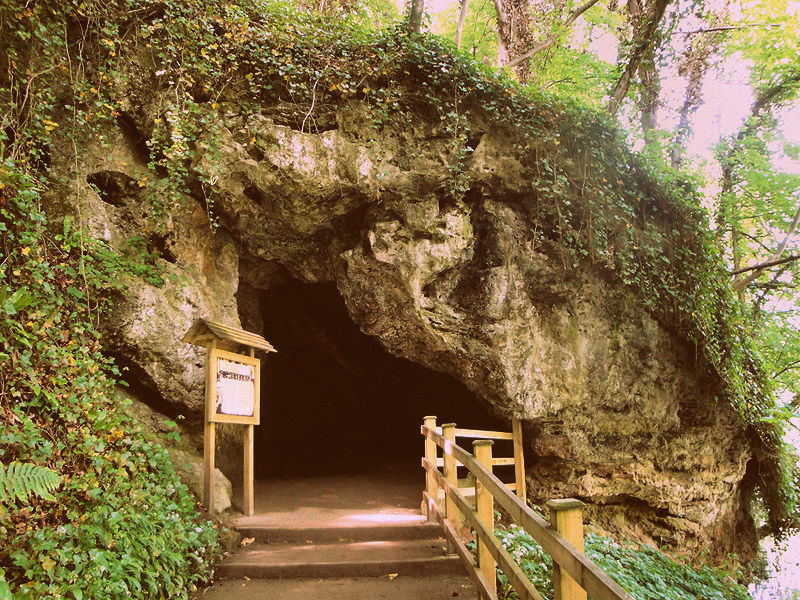 A Fairy Tale for a Land-Baby (1888 & 1915); the entrance to Mother Shipton’s Cave in Knaresborough, “England’s Oldest Tourist Attraction” (shades of Salem!). In central and northern Europe the closing days of April and commencement of Spring converge on Walpurgisnacht, a bonfire festival based on both pagan and Christian traditions. 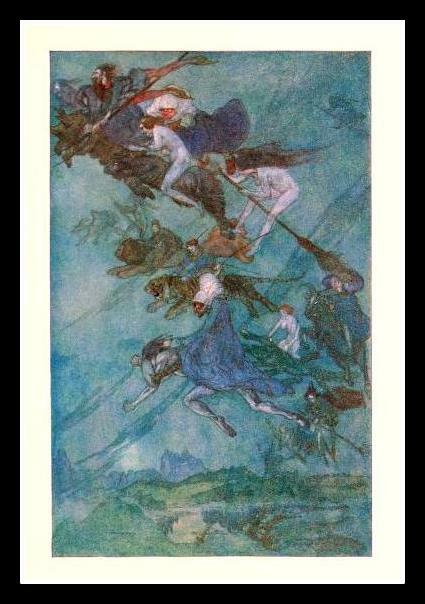 On the eve of May 1, the canonization day of Saint Walpurga, an English Christian nun and missionary based in southern Germany in the eighth century (and presumably was so named to replace a pre-Christian harvest goddess also named Walpurga), witches gather to fly off to the highest mountain (in the case of Germany, Brocken Mountain in the Harz mountain range) to pay homage to the Devil with a night-long bacchanalian celebration. Newly-empowered and inspired, they fly back to society, on broomsticks or goats, to continue their demonic service. 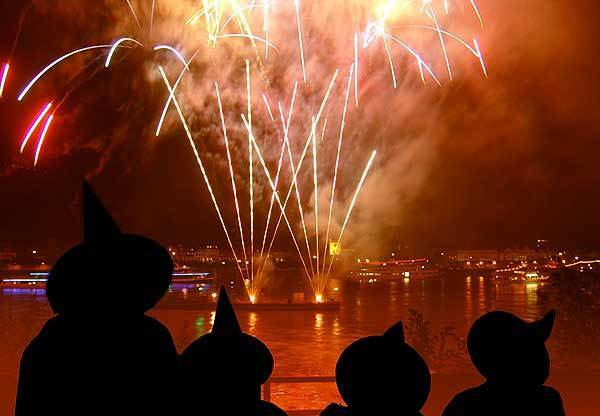 Fireworks over the Rhine on Walpurgisnacht, 2012, and Hermann Hendrich’s vision, 1901. 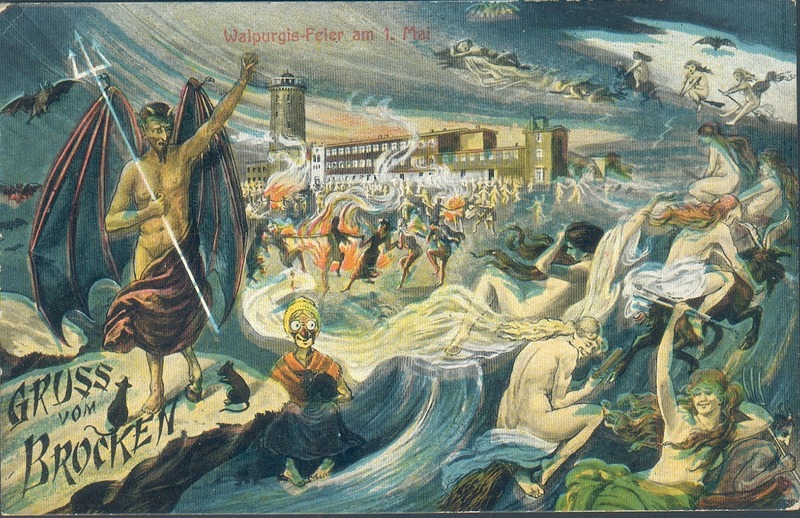 Like Halloween, exactly six months later, Walpurgisnacht is a perfect example of early medieval assimilation, in which a saint’s day is grafted onto an existing “calendar” and there is a clash of evil and good, or perhaps a last hurrah for evil before good prevails in the merry new month of May. Evil is always very, very close–but the actual ritual by which the witch enters into the pact with the devil–described and perceived as in inverse Sabbath–happens far away, in a remote place that one could only access through flight. 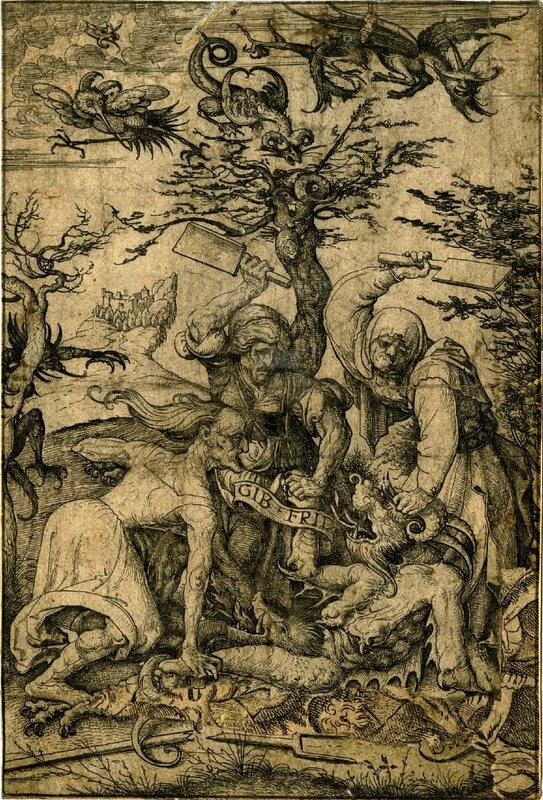 As I wrote about in an earlier post, fears about a conspiratorial demonic force intensified in the sixteenth century along with the Reformation, resulting in over 100,000 trials for witchcraft in the early modern era. Two hundred years later, after the Devil had lost much of his power, he was revived by Johann Wolfgang von Goethe’s epic and tragic Faust (1808-1831), with its vivid scenes of Walpurgis Night. 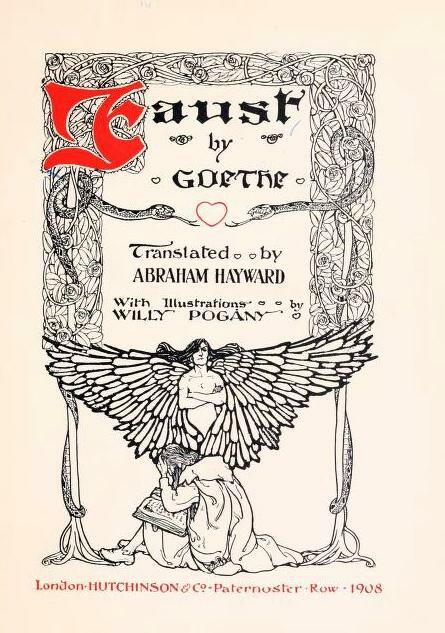 Title page of the 1908 Hayward/Hutchinson translation of Goethe’s Faust, with illustrations of Walpurgis Night by Willy Pogany. Goethe, along with his near-contemporaries the Brothers Grimm and a host of other authors and artists, was both reflection and inspiration for an intensifying interest in German folklore in the nineteenth century. 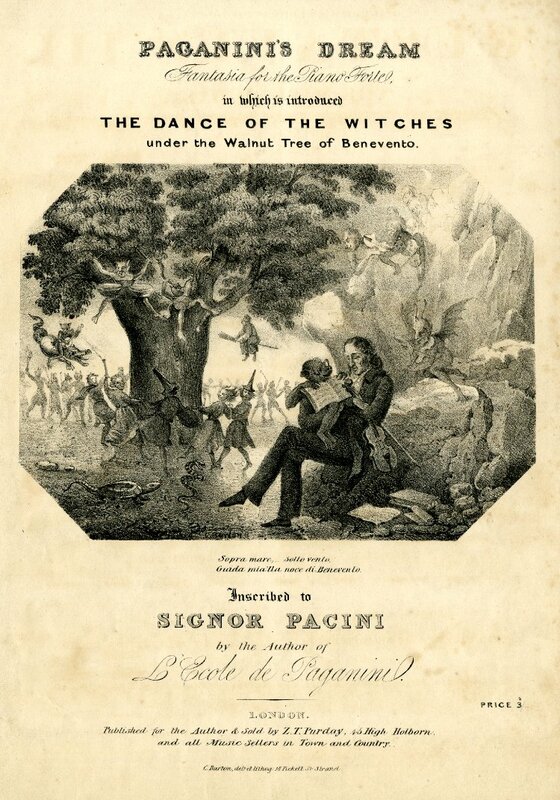 Witches became more fanciful than fearful; even if it was with or for the devil, they still danced. Given its long association with the witches’ sabbaths, the Brocken and its adjacent Hexentanzplatz (a plateau long referred to as the “witches’ dancing floor”) became popular tourist destinations. A hilltop hotel on the Hexentanzplatz drew a steady stream of visitors from 1870 on, and the addition of an open-air theater and the Walpurgishalle, a museum dedicated to Goethe and Walpurgis Night, increased their number after the turn of the century. The Hexentanzplatz became a place where everybody could come to dance, on the eve of St. Walpurga’s Day, Beltane, May Day, or simply Spring. 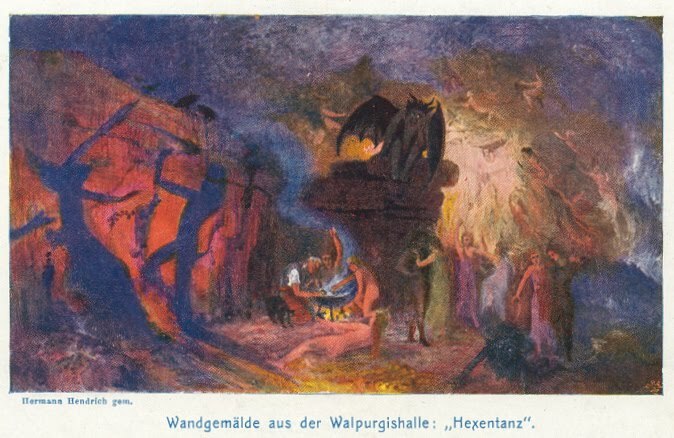 The focus is clearly on the Hexentanzplatz hotel in postcards from the 1890s and 1911 (along with the now-naked witches); a century later the more generic Wulpurgisnacht is celebrated in Meissen (photo by Tobi_2008@ Flikr). 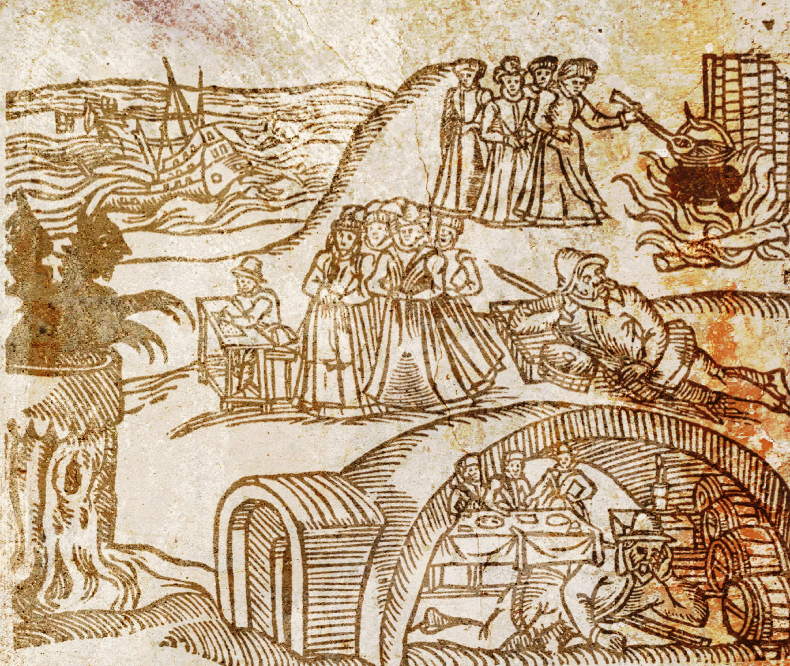 The witch trials in early modern Europe, which resulted in the execution of between 40,000 and 60,000 people and targeted double that figure, focused on devil worship more than anything else, but maleficia (harmful magic) was often the trigger, and the evidence, for the identification of conspiratorial witchcraft. 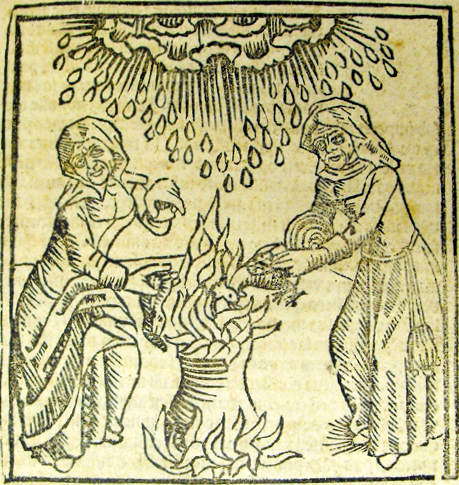 And of the various types of harm that witches were accused of committing, nothing was more generic, and more harmful, than weather witchcraft. 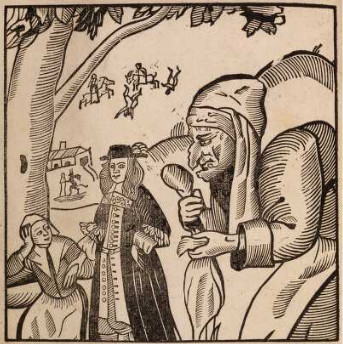 One of the earliest printed depiction of witches makes the connection concrete: two hag witches are literally whipping up a storm in a cauldron. Ulrich Molitor, (fl. 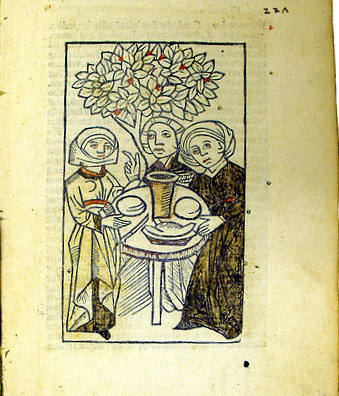 1470-1501), De lamiis et phitonicis mulieribus (Cologne, 1500). Even if we can’t understand the fear of witchcraft in our rational era, we can understand the threat of weather witchcraft to a civilization that depended on the climate for food, and life. Our supposed mastery of nature leaves us a lot less vulnerable–at least we like to think so. But in the premodern past, a storm could bring hunger at best and starvation at worst. The source of evil is always a problem in Christianity, as it is in every culture: why do bad things happen to good people? 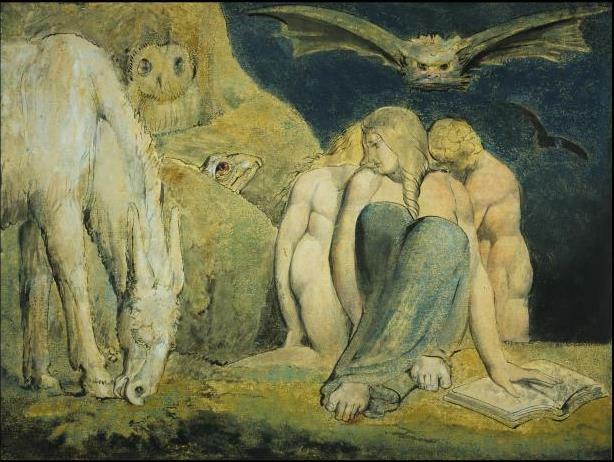 The devil and his witches–the servants of Satan–provided an accessible explanation. 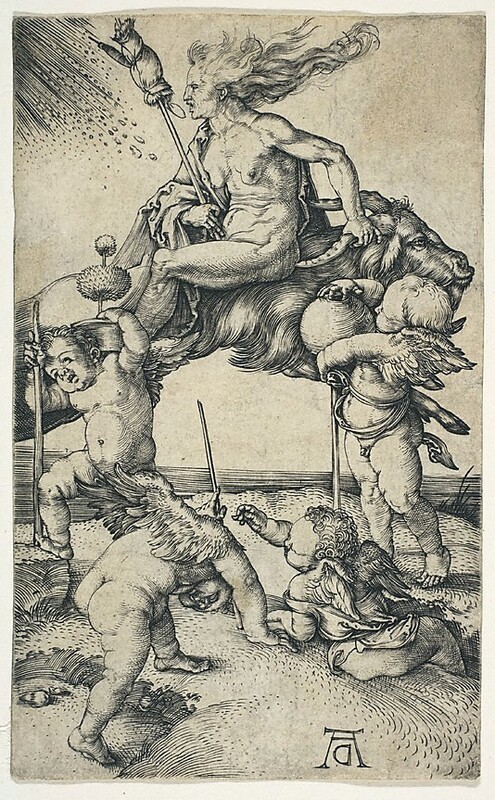 And for these reasons, I think that the earliest disseminated images of the witch focused on weather witchery: certainly those of the greatest printmakers of the day, Albrecht Dürer and his apprentice Hans Baldung (Grien) did: Dürer pictures a goat-riding witch attending by several putti and bringing forth rain, while Baldung’s more shapely weather witches are yielding their apple-capped flask to bring forth a storm with the aid of another demonic putto and of course, the demon-goat. 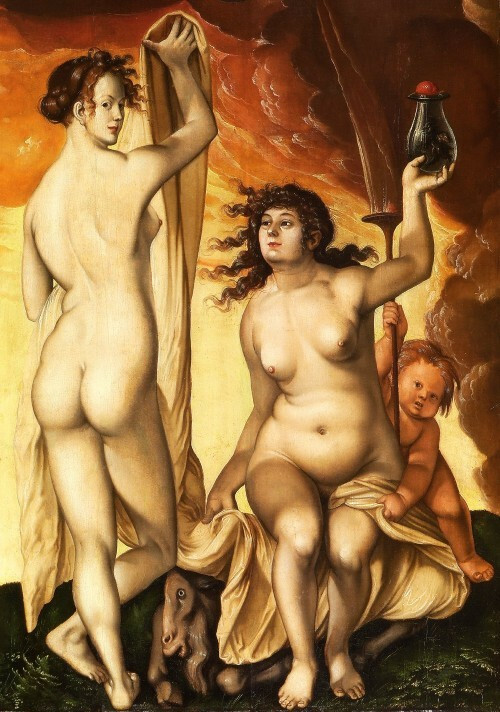 This particular image is obviously a painting, but Baldung created several influential woodblock prints of witches depicted in an overtly sexual manner, intensifying interest in them even more in the early sixteenth century. Albrecht Dürer, The Witch (1500-02), Metropolitan Museum of Art, New York; Hans Baldung Grien, The Weather Witches (1523), oil on panel, Städel Museum, Frankfurt. As I am writing this, I keep checking for updates on Hurricane Sandy, and I just read about the abandonment at sea of the Canadian replica tall ship HMS Bounty (made for the 1962 Marlon Brando film), and the loss of several members of her crew. 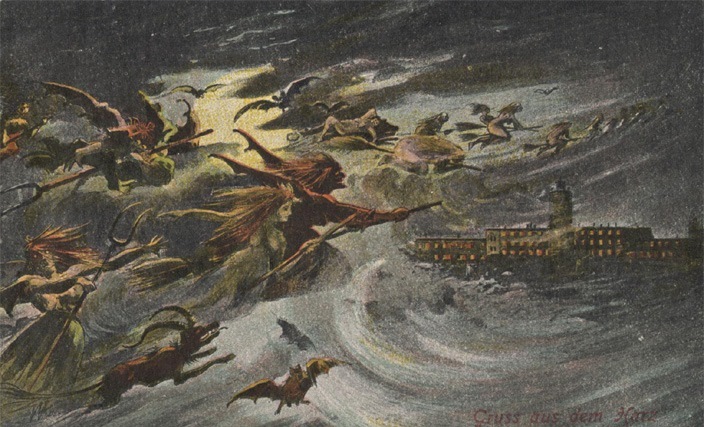 This was the particular witchcraft fear in Scandinavian cultures: witches stirred up storms at sea and sank ships. 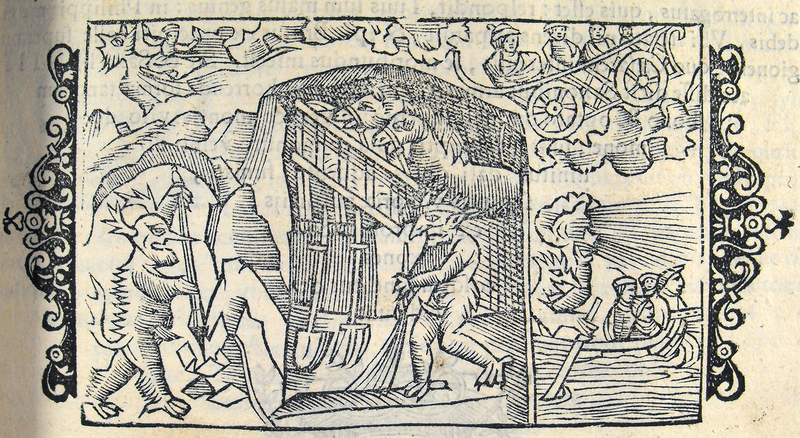 You can see this fear illustrated in the Historia de Gentibus Septentrionalibus of Olaus Magnus (1555), a grand compendium of Nordic popular culture and folklore, as well as in King James I and VI’s pamphlet about the famous North Berwick trials: Newes from Scotland – declaring the damnable life and death of Dr. John Fian (1591). 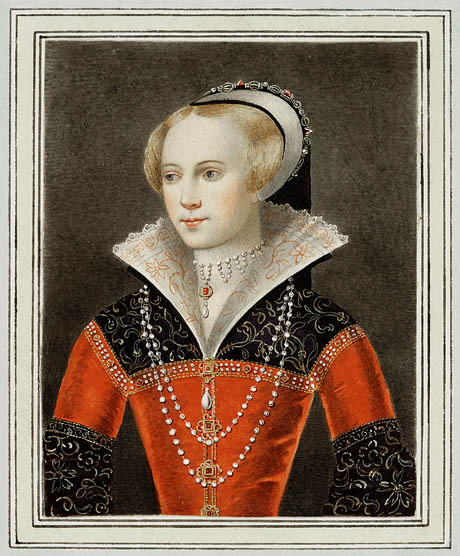 Upon his engagement to Anne of Denmark, James spent time in Scandinavia and became exposed to continental witchcraft beliefs: the stormy voyage he endured on his return trip home combined with his belief that as “God’s lieutenant” he was the target of demonic conspiracies inspired him to be a particularly zealous witch-hunter both in Scotland and England. Magnus’s Historia and Newes from Scotland woodcuts: Ferguson Collection, University of Glasgow Library Special Collections. 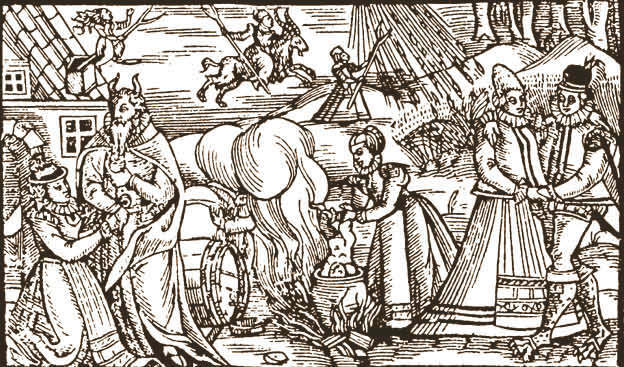 The contemporary record of one of the largest witch hunts in European history, occurring at Trier in western Germany from 1581 to 1593 and resulting in the death of over 360 people, is illustrated with a composite picture of all the activities of witches, including storm-making with a broomstick. In central Europe, hail seems to have been the most commonly-identified form of magical weather and could definitely provoke accusations. Hail does seem kind of magical, if you think about it. Title page of Peter Binsfeld, Tractatus de confessionibus maleficorum et sagarum (1592). 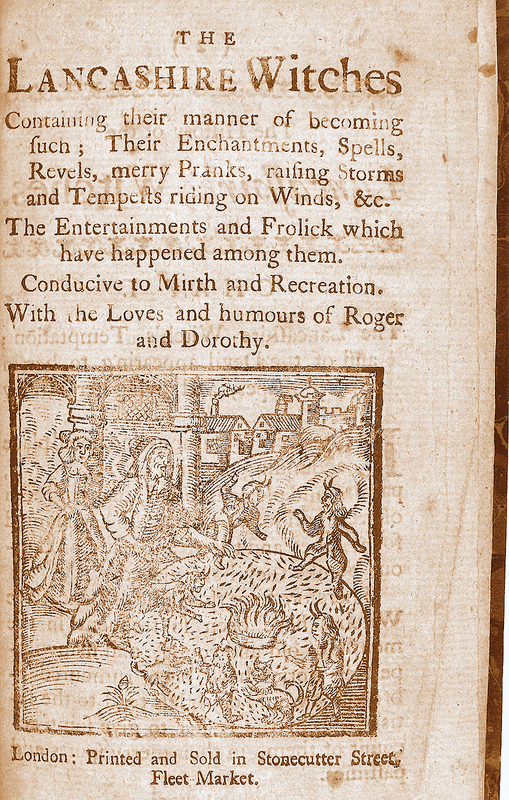 You can see from the title page of one of the pamphlets reporting the Lancashire (Pendle) trials of 1612, the largest trials in England, that weather witching was one of the accusations, along with riding the wind. 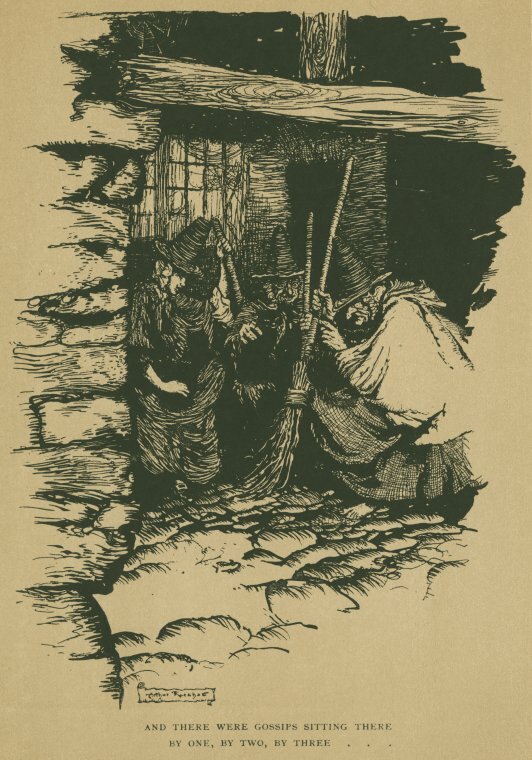 I am not certain if any specific weather charges were leveled at the accused witches here in Salem, although I do know that the intense cold, and the hardship it brought to this community, has been considered among several contributing factors in the background of the 1692 trials. This follows the European historiography, which has been considering the impact of the “Little Ice Age” on witch-hunting for some time. 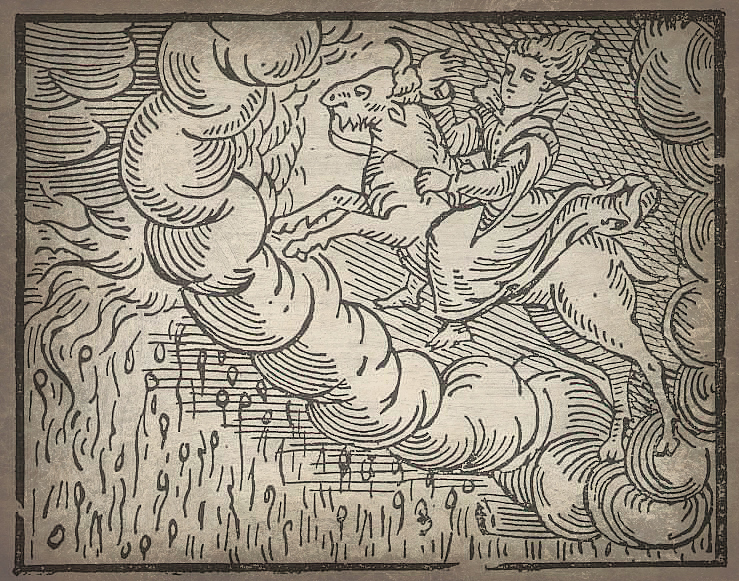 A goat-riding witch brings down a storm: from the Compendium Maleficarum of Francesco Maria Guazzo (1628).